FOCUS POINT have 3,000 sets of SOLOCARE AQUA® starter kits to give away! REGISTER NOW to redeem a free starter kit at selected Focus Point outlets. Visit FOCUS POINT facebook page to register & redeem your free SOLOCARE AQUA starter kits now! Cleans, rinse, disinfects, stores, removes protein and lubricates all soft contact lenses. 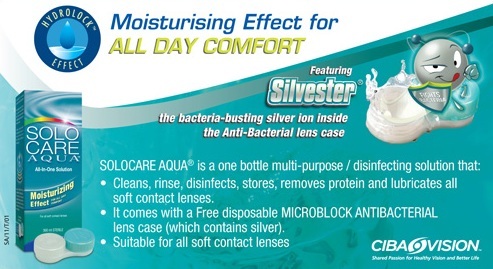 It comes with a Free disposable MICROBLOCK ANTIBACTERIAL lens case (which contains silver).